Dave and I vacationed in Seaside Florida for a few days before my family came down to Destin and the family vacay started. It was relaxing, fun and peaceful, just what the beach is all about. 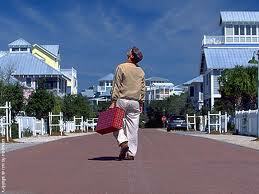 If you've never heard of Seaside, Florida you might recognize the town from the movie The Truman Show. It's a very picturesque little town. Beer and Wine to go from Modica Market and Dave got to carry my suitcase up that spiral staircase. :) We had a casual dinner at Bud & Alley's Pizza Bar and relaxed in Dreamboat watching Step Brothers. Our first full beach day - it was overcast for a while but it cleared up. I got a lot of reading done this day and that's about it cause that's how I roll at the beach. The drinks were good though! And the view was awesome! So in lieu of spending our down payment on a crab cake we decided to do a food crawl through Seaside! It was the best idea I've had in a while. On our last night, my family came to meet us for dinner at the Taco bar! Seaside was wonderful but we spent the rest of the vacation in Destin with the fam and had a great time as well. I'll bore you with those pictures later.